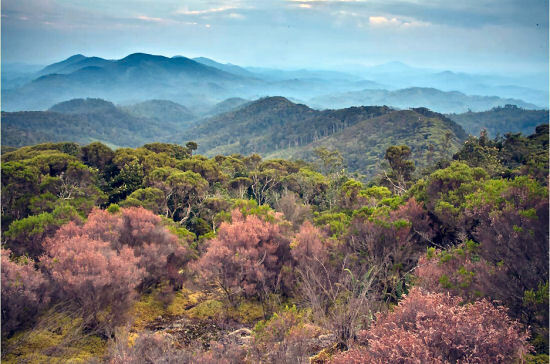 UQ School of Geography, Planning and Environmental Management and Wildlife Conservation Society in New York researcher Associate Professor James Watson said findings demonstrated alarming losses comprising a 10th of global wilderness since the 1990s. These findings are published in Watson et al., Catastrophic Declines in Wilderness Areas Undermine Global Environment Targets, Current Biolog. In his press release, Professor Watson noted that the Amazon and Central Africa were hardest hit. But the paper shows that in Australia, one of the three countries with the most remaining wilderness left. "Australian rangeland and desert ecosystems, the ecological influence of large spatial-scale surface-groundwater hydrological dynamics is pervasive, and losses in one area can degrade habitat quality elsewhere, with significant, long-term implications for biodiversity." “The findings underscore an immediate need for international policies to recognise the value of wilderness and to address the unprecedented threats it faces,” Dr Watson said. “Globally important wilderness areas are completely ignored in environmental policy, despite being strongholds for endangered biodiversity, for buffering and regulating local climates, and for supporting many of the world’s most politically and economically marginalised communities..
Dr Watson said much policy attention had been paid to the loss of species, but comparatively little was known about larger-scale losses of entire ecosystems. 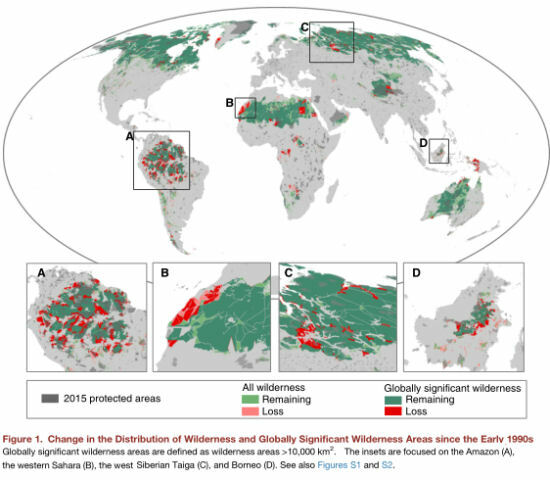 The researchers mapped wilderness areas around the globe, with “wilderness” defined as biologically and ecologically intact landscapes free of significant human disturbance. They compared their map of wilderness to one produced by the same means in the early 1990s. The updated map shows a total of 30.1 million km2 (more than 20 per cent of the world’s land area) remains as wilderness, with the majority in North America, North Asia, North Africa, and Australia. Comparisons between the two maps showed an estimated 3.3 million km2 (almost 10 per cent) of wilderness area had been lost since the early 1990s, with a 30 per cent wilderness loss in South America and a 14 per cent loss in Africa. “The amount of wilderness loss in just two decades is staggering and very saddening,” Dr Watson said. “We need to recognise that wilderness is being dramatically lost and that without proactive global interventions we could lose the last jewels in nature’s crown. “You cannot restore wilderness. Once it is gone, the ecological process that underpins these ecosystems are gone, and it never comes back to the state it was. Dr Watson said the United Nations and others had ignored globally significant wilderness areas in key multilateral environmental agreements, but that had to change. “If we don't act soon, it will be all gone, and this is a disaster for conservation, for climate change, and for some of the most vulnerable human communities on the planet,” Dr Watson said. 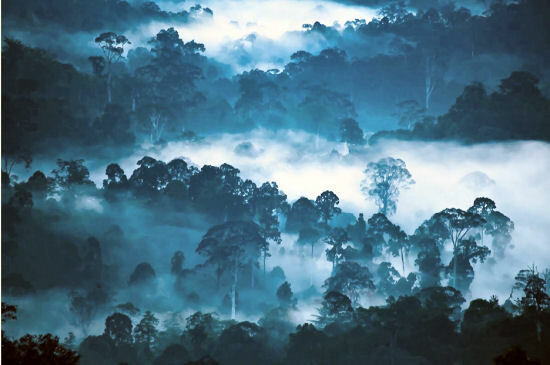 The research, Catastrophic Declines in Wilderness Areas Undermine Global Environment Targets, is published today in Current Biology. It involved UQ PhD candidate James Allan and UQ School of Biological Sciences honorary researcher Oscar Venter. Watson et al., Catastrophic Declines in Wilderness Areas Undermine Global Environment Targets, Current Biolog. With human population and human activities- agriculture, forestry, mining, tourism and urbanisation inexorably rising as well as the often stated demands that wilderness and national parks earn their keep, the universal process has to be one of ongoing loss of nature. Wildlife is culled and pruned in holiday destinations to accommodate yet more tourism.Countless times the goose who laid the golden egg has been killed. Ultimately (or sooner!) there will be no escape and humans themselves will be as zoo animals or animals in a global- scale and futile experiment.